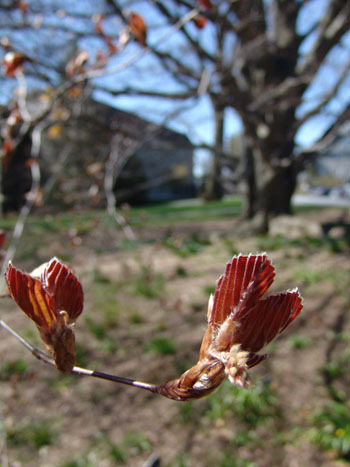 This week the cycle of life takes another turn at the Scott Arboretum. We say goodbye the Fagus sylvatica ‘Atropunicea’, European purple beech, that has stood at the entrance to the Terry Shane Teaching Garden since 1881. Trees, like all living things, have a life cycle and cannot stay with us forever. 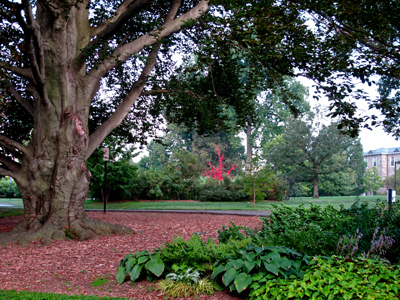 As an educated reader of landscape, you can observe the signs that a tree is in decline. 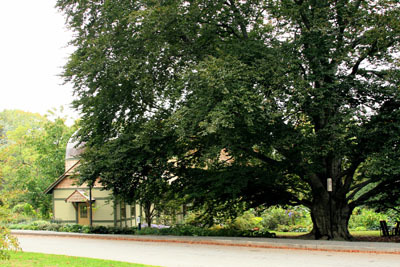 This European purple beech was planted as a class tree, commemorating the class of 1881. It’s beautiful smooth bark added interest in the winter. Its lovely leaves emerged deep purple and faded to a purple-green during the summer, adding color to the garden. The sweeping branches provided shade and privacy. While majestic in the garden, the symptoms of decline have been evident for a number of years. One of the first symptoms of problems was visible during the spring flush of new growth. The tree would leaf out beautifully with vibrant deep purple leaves, but within several weeks, many of those leaves would shrivel and die. This is a symptom of Phytophthora bleeding canker which disrupts the water transportation inside a plant. 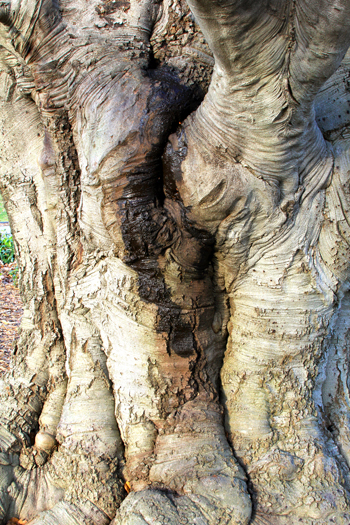 The weeping sticky sap from the canker was visible on the west side of the trunk. A dramatic indictor of decline was the loss of a major limb in 2010. This loss changed the landscape allowing more sunlight into the rear entrance of the garden, thus resulting in some new plantings along the pathway. An observer may have also noticed the growth of fungi throughout the crotches of major tree branches. 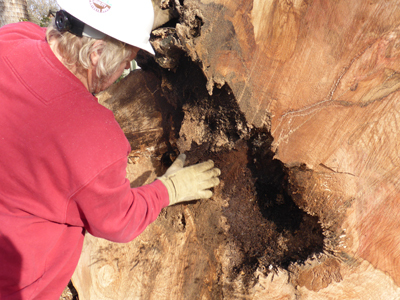 In more recent years, the root rot symptoms of Phytophthora canker were evident and gardeners observed the bark around the roots coming off in chunks. As a landscape observer, we often look up and marvel at the majestic canopy of trees. 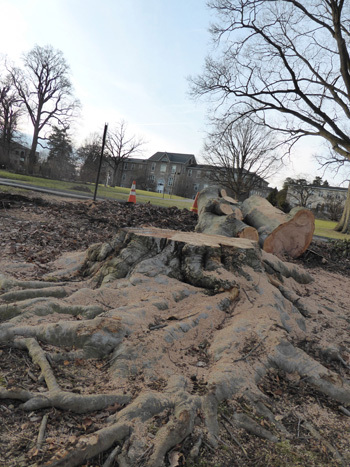 Within the past year, over 50% of the European purple beech’s canopy was lost, leaving it a skeleton of its former self. Many living things succumb to old age and our tree friends are no different. 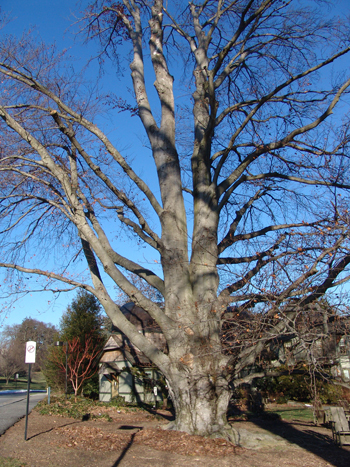 At over 133 years old, this beech also suffered from extensive dry rot in addition to its various other ailments. After assisting our green giant for many years it was time to say goodbye before someone or something was injured by falling debris. The garden has become less shaded with the death of this tree, allowing the cycle of life to continue by opening up this space to the realm of sun-loving plants. Oh my – that is SO sad. I am sitting here crying for our loss. there when they took it down. It is a sad event, Diane. As a staff, we have been lamenting the loss of the tree all week. Hopefully we will plant an equally majestic tree in its place. That is so sad. What a beautiful, awesome tree. I have many fond memories of events there. There will be such a hole in the garden for a long time. So sorry for your loss. The empty space will be a constant reminder. However, when these tragedies happen, new opportunities occur and a new welcoming design will be created for your daily enjoyment. I’m so glad I had the opportunity to experience that majestic tree on my visit in 2013. I was also appreciative that we took our family photos in front of the tree this fall. Those photos will have extra meaning now. This loss while devastating has dramatically change the garden. It will be exciting to see a new design evolve. What a huge loss for you, but obviously unavoidable. We appreciate your very educational posting of pictures with explanations of all the signs and symptoms of decline. Thank you for reading our blog. We hope to educate about all aspects of gardening from “birth to death”. I did neglect to mention some symptoms of decay like the presence of Ambrosia beetle and Twolined Chestnut Borer. Both insects attracted to declining trees and are often seen on older European beech trees. It is always difficult to see an old friend taken down. Trees are such historical time keepers. They provide so much to so many. A group of students and I visited this tree this past fall and knew that it only had a short time left so we took pictures and enjoyed it while we visited. 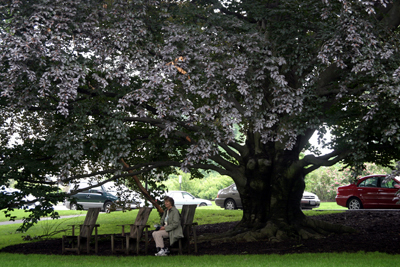 Thanks for doing this tribute article for all of us who visit Scott Arboretum.